Special Containment Procedures: Due to SCP-1568's lack of large scale mobility, SCP-1568 is to be contained in a boathouse in ██████, Florida. The location of SCP-1568 is to be marked as private property. The inside of SCP-1568's cell is to be lined with steel, to deter it from exiting. SCP-1568 is to be fed 100 kilograms of fish per day. Testing with SCP-1568 is to be approved by Level 4 Personnel. SCP-1568 is to receive weekly cleaning for algae and barnacles. Any containment breaches are to be handled by Mobile Task Force Theta-5 (Aka "The Bigger Boat"). Description: SCP-1568 is a member of the Dardanus calidus (Hermit Crab) species. SCP-1568 measures 25 meters in length, 10 meters in width. SCP-1568 moves at a high rate of speed, matching that of the boat it is using as a shell. SCP-1568 shows no aggressive behavior, despite attempting escape on several occasions. SCP-1568's claws show extreme flexibility, and are capable of reaching completely around SCP-1568-1. SCP-1568 is normally a blue-green color, but possesses the ability to change according to the current color of the water. SCP-1568-1 refers to the upper shell of SCP-1568. 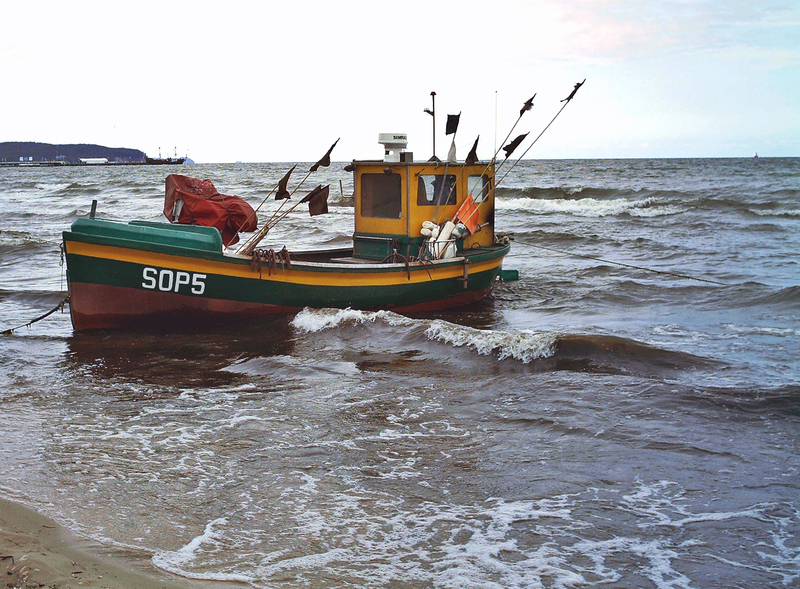 SCP-1568-1 is a fishing vessel from 19██. The interior of SCP-1568-1 shows no anomalies, despite descending into the interior of SCP-1568. It is possible to fish off of every side of SCP-1568-1 except for the front of SCP-1568-1. SCP-1568-1 has the word "Kingston" written on its right side. Instances of SCP-1568-1 do not experience any extra drag that SCP-1568 would normally cause. When fishing off SCP-1568-1 using nets, SCP-1568 will typically reach into the nets with its claws and remove fish, promptly eating them. SCP-1568 will continue this behavior until all fish have been consumed or until the net has been retracted. Attempting to 'drive' SCP-1568-1 from its current location while fish are still being caught have proven unsuccessful. If fish are no longer being caught, or nets are not redeployed within ██ minutes, SCP-1568 will capsize SCP-1568-1. Attempts to rescue subjects during this period have proven successful. SCP-1568 will begin to consume subjects in the water within ██ minutes. SCP-1568 will typically tear subjects into smaller pieces before consuming them. SCP-1568 shows no aggression towards subjects that have not boarded SCP-1568-1. Attempts to remove subjects before being consumed have been successful. SCP-1568 will not attempt contact with subjects in the water that have not been inside SCP-1568-1, and will retract into SCP-1568-1. Investigation of abandoned instances of SCP-1568-1 show that holes left are too small to contain SCP-1568. It is currently unknown how it decides to change 'shells.' The inside of instances of SCP-1568-1 are typically extremely smooth, despite the material used in that area. Bottom Trawl SCP-1568's claws reach to a length of 41 meters, reaching into the net and grabbing multiple fish at once. SCP-1568 continued this behavior until net was withdrawn. Cast Net No response from SCP-1568. Drag Net SCP-1568's claws reach to a length of 27 meters, reaching into the net and grabbing multiple fish at once. SCP-1568 continued this behavior until the amount of fish in the net was depleted. Fyke Net No response from SCP-1568. Gill net SCP-1568 attempted to grab fish, but due to the transparency of the net, cut the net and released several fish. Lift Net SCP-1568 cut the net in several places while attempting to grab fish. Seine Net SCP-1568's claws reach to 34 meters, reaching into the net and grabbing several fish at once. SCP-1568 continued this behavior until net was withdrawn. Incident Report 1568-1: A dead instance of SCP-1568 was found off the coast of Menai Strait, Wales. The instance of SCP-1568 was not accompanied by an instance of SCP-1568-1. Autopsy of the subject revealed that SCP-1568's biology consists largely of digestive tract. SCP-1568 lacks a visible posterior orifice, despite having an otherwise full digestive tract.